None of the Russia’s stadiums are currently up to World Cup standards. In fact, half of them will have to be built from scratch. The Russian bid features 16 arenas, including eight that exist only on paper, but now that Russia has won hosting rights, the proposed architectural concepts should become a reality. New 40,000–45,000-seat stadiums will be built in Krasnodar, Kaliningrad, Nizhny Novgorod, Rostov-on-Don, Samara, Saransk, Volgograd, and on a site just outside southern Moscow at the intersection of Moscow's ring road with the M-2 Simferopol motorway. Moscow’s Luzhniki stadium is also in for a major overhaul. Russia’s biggest stadium will see a downward extension to bring its capacity up to 90,000 seats. The plan envisages lowering the field another four meters, removing the athletic track and replacing the artificial turf with natural grass. Also, dozens of smaller stadiums and 72 training bases across the country will be renovated to provide training facilities for participating national teams. Russia’s hotels appear to be in better shape than its stadiums, but they are far from ideal. In order to come through on its promises, Russia will have to build or refurbish at least 19,000 hotel rooms. An $11 billion long-term government program will spearhead the effort. Two-thirds of the funding will be used to build three-star hotels, which are both the most in-demand and the most few and far between in Russia. At least six more four-and-five-star hotels will be built to accommodate football teams. The only city where no new hotel construction is expected is St. Petersburg. The Russian Organizing Committee believes that renovating the existing hotels will do the job. Saransk, on the contrary, will get 10 new hotels right away, some of which have already been named. One of Russia’s two perennial problems (the other being idiots) will be taken on using, as usually, tax-payer money. Hopefully, having the World Cup on the horizon will prompt road builders to do their job at a faster pace than usual. By 2018, a toll road will connect Moscow and St. Petersburg (with or without the controversial Khimki Forest), and existing federal highways (Don, Volga, Kaspy, Urals, Baltia and Kholmogory) linking Moscow with other World Cup host cities will be upgraded, with most of them fully or partially switching to the toll system. While improving the condition of the railways condition to the needed level, the emphasis will be put on high-speed trains, such as the recently introduced Sapsan service between Moscow and St. Petersburg. A new high-speed line will be constructed from Moscow to Smolensk and beyond, up to the western border, thus enabling passengers to make an end-to-end journey in just two hours. Major overhauls will be made along the St. Petersburg – Helsinki route, which will carry Northern European fans into Russia, and also on lines linking Moscow to Kazan and Sochi in the south. The 2018 World Cup will become a litmus test for Russian airlines and related infrastructure that will have to handle far bigger than usual swarms of passengers hurriedly flying from Krasnodar to Yaroslavl and from Volgograd to Kaliningrad. For lack of direct flights, many of them will have to make their connections in Moscow. To avoid a transport meltdown, by 2015, the Moscow and St. Petersburg airports will double their capacity, while Kazan and Sochi will quadruple theirs. Samara and Kaliningrad will redesign and expand their existing facilities, while Rostov will get a new airport. Five cities will make do with temporary terminals that will be taken down after the World Cup. No need to put the cart in front of the horse. The official word is that the adopted government programs and the current pace of infrastructural development are more than sufficient for the World Cup. The big plan, which the Russian government announced not so long ago, is to provide nationwide broadband access, switch television networks to digital broadcasting by 2015 and double or triple data transmission capacity for telecom trunk lines. To attract tourists, the World Cup organizers want to leverage Russia’s rich cultural and geographic diversity. Where else on the planet will you be able to go from the relaxing subtropical sun of the Black Sea coast to the refreshing ambiance of the Baltic seaboard or from Europe to Asia, all during the World Cup? Also, the host cities are conveniently grouped into clusters, so even the not-so-curious tourists will be able to stay in the same region to attend at least one group tournament. To make sure that potential tourists are not put off by excessive paperwork and mobility constraints, the Russian authorities decided to allow visa-free entry for those who book match tickets in advance. “We are ready to provide additional government guarantees. They will apply to visa-free entry and further movement between host cities granted to the World Cup participants and guests," said the top government sponsor of the Russian bid, Prime Minister Vladimir Putin. All host cities will deploy a Secure City System complete with a network of CCTV cameras, which will be used to provide surveillance over all public crime, from pickpocketing to crowd fights. Face recognition features will help keep repeat offenders away from stadiums. A special cross-ministerial security authority will be set up to assure law and order throughout the World Cup. 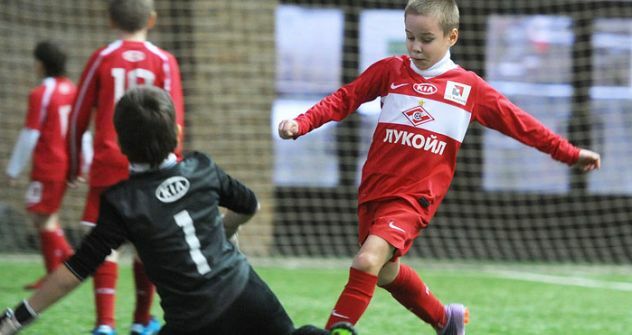 The Russian Organizing Committee envisages a host of programs to support the development of youth football. Although their pupils are unlikely to take part in the 2018 World Cup, except for a special junior tournament proposed in the bid, the investment will pay off all the same when the training framework will start working smoothly. The key initiatives put forward by the Russian Football Union (RFU) include constructing new football stadiums and grounds and opening of new sports schools. These programs are already underway, but they could clearly be more proactively implemented and on a broader scale. It is hard to tell what other programmes are supposed to achieve. One can only try and guess the true meaning behind the RFU’s mystifying titles, such as RFU Goal and Football of the Future.